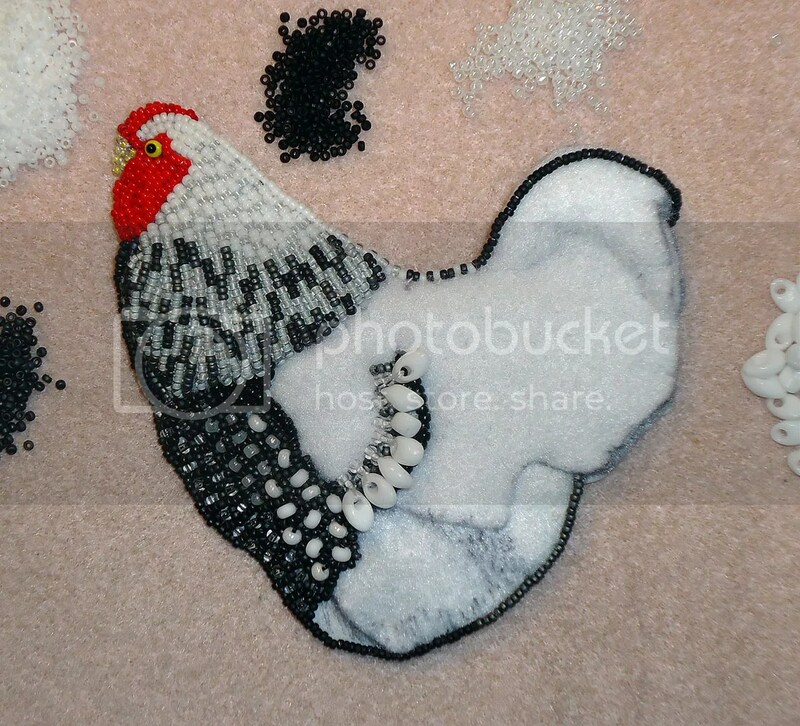 The Making of a Beaded Rooster..
During the past couple of weeks, I have been busy working on a commissioned bead-painting. 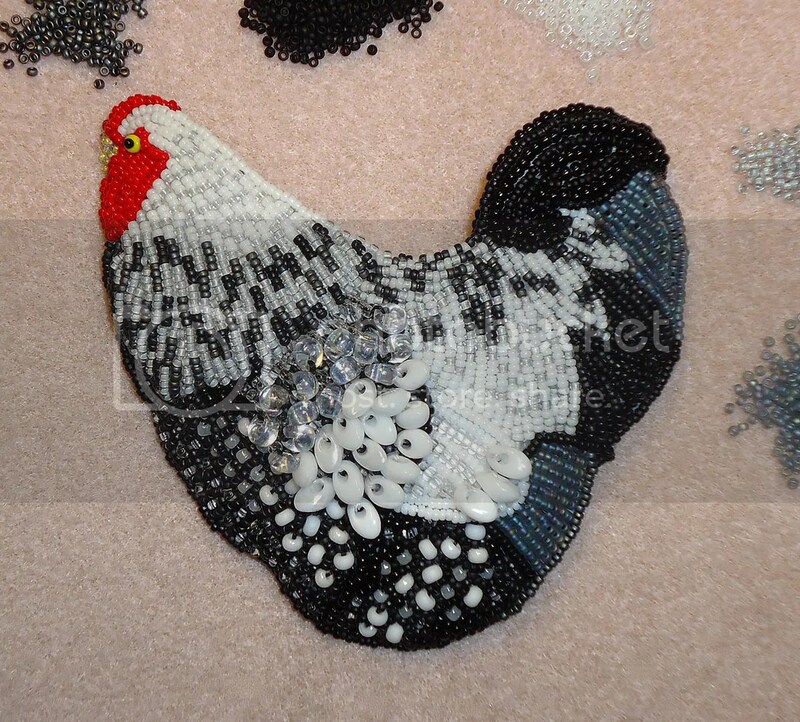 This one will feature quite a different subject than I usually bead – a Silver-Laced Wyandotte Rooster! I started with a sketch which I used to created a template. Using the template, I cut out several layers of felt in different shapes. These layers will help create the relief aspect of my beadwork. 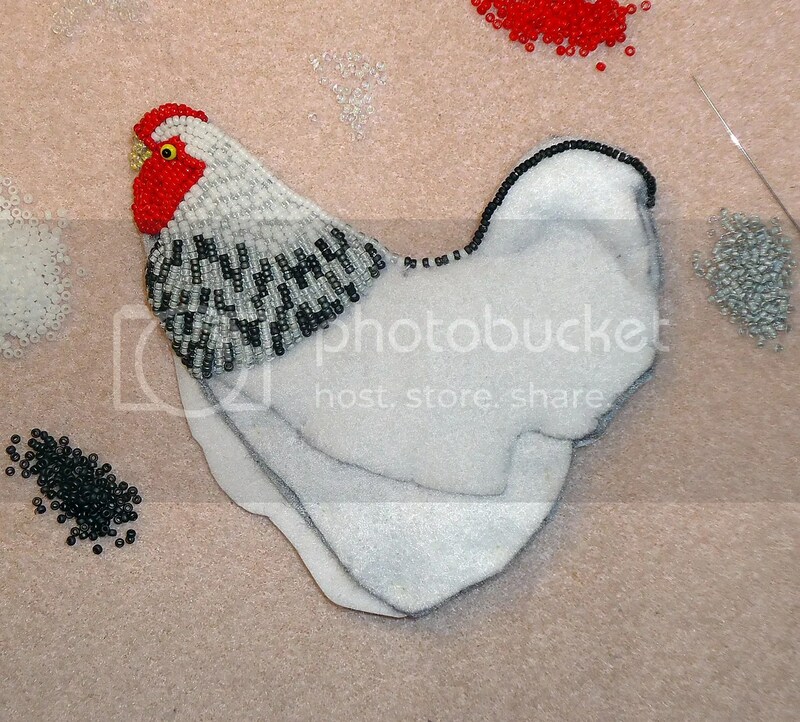 Then, I began stitching mostly Japanese size 15 seed beads to my felt foundation (as well as a few larger beads). I used a few different grays and white, as well as red & yellow. Once I reached the bird’s wing, I decided to try doing bead embroidery with long Magatamas! These are the large oblong shaped white beads in the photo above. I got the crazy idea to use these as feathers! 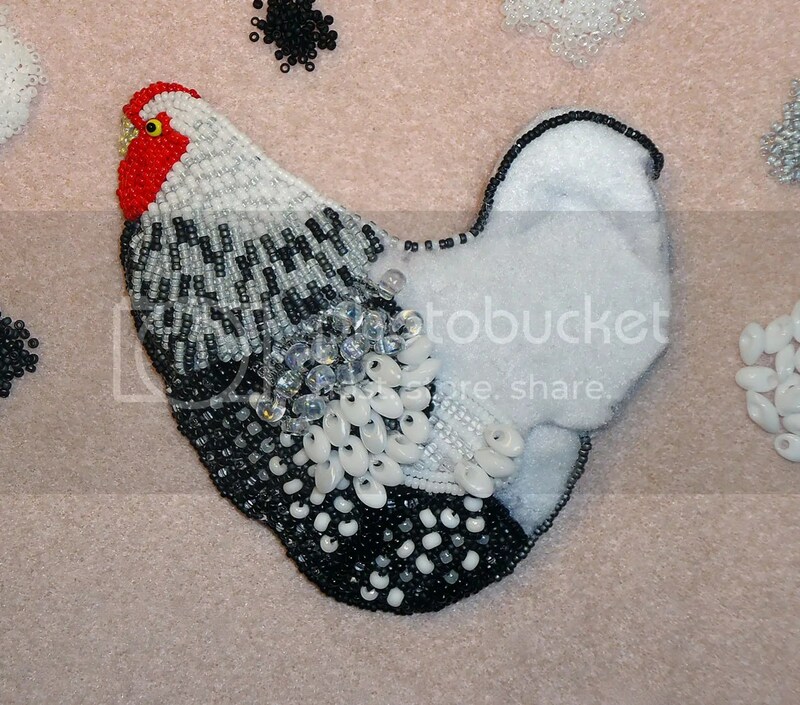 After I completed the wings, I continued beading the rest of the rooster’s body.. BUT, I am not finished yet! Please check my Facebook page for the latest updates on this project..
Also, just a quick note to let you know that my beadwork has been featured on the Street Art United States blog. I am honored! Please stop by and take a peek! A couple of days ago, I asked if you could guess what my next piece would be. Crymson was the only one who came close… she knew it would be a car. I think I’ve found my niche when it comes to creating beaded vehicles. I enjoy making them because each one presents new challenges, and there are so many cool cars to bead; the possibilities are endless. Above is my sketch of an old Triumph GT6. These British sports cars were produced from 1966- 1973, and I believe the one in my drawing is a ’73. I saw this car when I was in London in April. It sits in silence atop an old shipping container near Brick Lane. I studied it for awhile because the driver, a ghost-like skeleton, intrigued me. I did a little research and it turns out that the car was originally yellow until one day, when someone came along and painted it pink. That someone is Britain’s most famous guerrilla artist, Banksy. Banksy’s graffiti can be seen on the streets of London, as well as in several other cities around the world. He intrigues me because he is quite elusive. His true identity is unknown, but his work is unmistakable. In fact, he has made quite a name for himself simply by stenciling his name all over the city. But, that’s not all he’s done. He’s been known to sneak his pieces into museums such as the Tate Modern, and the British Museum. And, one of his best pranks may be when he doctored about 500 copies of Paris Hilton‘s debut album and replaced them with his own version.